Looking for an easy-to-use online store builder with full features? Read our review of PrestaShop first to get all the information you need to make a smart decision. Sometimes, open-source site builder software is just way too complicated. Those who are new to creating websites are seeking solutions that are intuitive and easy to use. Intermediate-level web designers might scoff at the idea of WordPress or Magento being confusing, but they present a real learning curve to neophytes. Thankfully, PrestaShop does a wonderful job of providing that open-source feel without the more intimidating interface. It all starts with the visually simple PrestaShop website, where you can download the software, sign up for a web hosting solution, and even select an expert designer if you wish. On the other hand, you might consider playing around with the tools without any assistance, and that’s one of the coolest parts about PrestaShop. You don’t have to pay, and it competes with the likes of Shopify when it comes to ease-of-use. 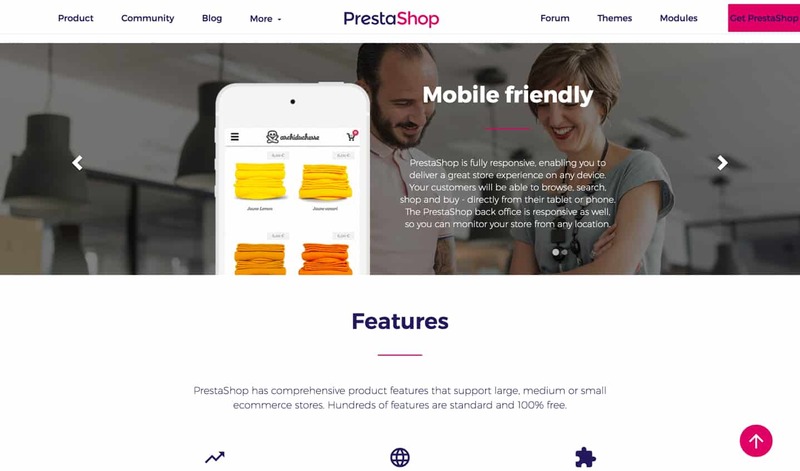 What Do You Get From PrestaShop? Should You Go With PrestaShop? The basic package from PrestaShop is an open-source e-commerce content management system, website builder, and marketing package. You can launch an online store quickly, and the wide range of themes expedite the design process. Hosting isn’t included, but you do have the option to sign up with one of PrestaShop’s hosting partners. You also don’t get much design support, but the open-source community is always willing to help. Plus, you can opt for an expert designer at a reasonable charge. Since it’s an e-commerce website builder, PrestaShop has a dashboard that includes both design tools and options for managing your store. For example, it provides a product page creator with settings for product variants and digital items. You can then jump to the marketing area for setting up automated email and connecting your social media accounts. Although PrestaShop offers hundreds of modules that integrate with the software, the majority of required e-commerce features are packed into the basic software. Because PrestaShop is open-source, it’s completely free. This means you don’t have to pay a dime for the actual software. It is self-hosted, however. So, you’ll end up paying for items like hosting, domain names, and maybe a template if you’re looking for a cool design. But other than that you can navigate to the PrestaShop website, click on the Get PrestaShop button, then download it to your computer. PrestaShop is a local software, but you might find some hosting companies that let you integrate and install it without having to do any manual FTP work. Over 500 features currently in the system and dozens more added on a regular basis. Over 1,000 modules and themes. You can design your e-commerce website the way you want and add the functionality it needs with the proper modules. PrestaShop is translated into over 25 languages. So you could potentially expand your business to attract overseas visitors by having foreign language versions of your site. An example of this is when Amazon created new versions of its site in a variety of languages to target foreign markets. A custom template comes with PrestaShop for quickly constructing your own custom build instead of choosing a pre-built one from the template store. Those are the core features. They get your e-commerce site launched and ready to go, but it’s worth talking about some of the 500 features already built into the system. Keep in mind that this number is staggering compared to some of PrestaShop’s competitors. Some people find it intimidating, but like any software (Take Microsoft Excel, for example) many people use all of the features, while others simply block out the more complicated ones. PrestaShop offers a powerful and intuitive product creation and management area. It starts with a module for quickly creating products, configuring features, and setting values. You can create groups of products to get bigger sales and organize the store. The software even has a spot for customizable goods, where the customer would upload files for something like a t-shirt design or something similar. Both product variants and attributes are supported, and PrestaShop has a full feature set for selling digital products like e-books, music, and photographs. The product pages are in-depth and customizable, with options for attaching files or adding whatever additional information is needed. You can set a minimum quantity and set up a message to display whenever an item goes out of stock. Along with categories and subcategories, inventory tracking, supplies management, and manufacturer creation, the product management area is top-notch. When customizing an online store you typically want two modules, one that’s extremely easy to make quick edits with and another more advanced section for adding or changing the code and customizing however you want. As an open-source solution, PrestaShop has both visual builders and file access. With the features, you can set up different payment methods, change shipping methods and enable an SSL. Many people use PrestaShop to configure a catalog in the shop, while others are more inclined to display products individually. An internal search engine tool for helping your customers move around the store and find products easier. A search bar that brings up product information as the user types in keywords. A search box on each 404 page. An area to talk about your store and tell customers what your company is all about. A Google Maps integration, just in case you have any physical shops that people might want to visit. A navigation panel in the checkout area. Tools for customers to adjust things like addresses for shipping and payment. An option for customers to validate orders. A customizable confirmation page after checkout. As you can imagine, Google can be a major source of traffic to your website. However, to direct users to your online store, Google has to know what your store is so that it can rank your site appropriately. One way for you to help Google improve its understanding of your site and its context with regards to other sites is to use rich snippets. Rich snippets are sets of structured data markup that you can add to your existing HTML. This markup helps Google (and other search engines) better understand the information on your site. While you could easily hand-generate rich snippets, there is an addon in the PrestaShop Addons Marketplace that streamlines this process. With this addon, improving your website and online store’s SEO does not have to be difficult! One of the perks of open source software is that the source code is open to anyone who wants to see it. This means that third-parties can easily create powerful tools that work well with the stock PrestaShop package. Please note that not all third-party tools for PrestaShop are free to use — some may require licensing fees, but depending on the services offered, you, as a busy small business owner, may find it worthwhile to splurge for the product. One way to keep the information on your site fresh is to maintain a blog. While the core PrestaShop installation does not include a blog, there are many add-ons available in the Addon Marketplace that will install a blog onto your site. If you have an existing blog (for example, you might have a WordPress site already), you can find something that will display your posts in your store. If you do not, you can find something that will add full blogging functionality to your site. A big part of running an ecommerce store is the ability to comply with laws. You don’t always see legal support through e-commerce software, so this is a huge benefit. For example, you receive guidance and design tools for making quick pages and modules that explain legal information to customers. PrestaShop also has several checkout and shopping cart tools for making your shop compliant with certain country’s laws. For example, Germany has specific shopping cart rules that must be followed. Tax configuration can be done, and PrestaShop lets you show taxes for customers in the United States. Another great aspect of the PrestaShop software is that you typically don’t have to go find extra plugins, apps, or integrations. Custom features are a different story, but the typical marketing tools are all there. Coupons codes for customers to redeem in your store. Pricing rules that dynamically change depending on certain parameters. Special offers based on things like products and customers. You have the ability to offer free shipping on all or some products or when someone spends a certain amount of money. Promote specific products on your homepage and suggest related products on regular product pages. Drop product promotions in your homepage slider for immediately showing your users what they can save on. Ask customers whether or not they would like gift wrapping during the checkout. An email system for sending out email to those who have abandoned their carts. Email can include products the customers have already viewed. Customers can sign back in and see all of the products previously placed in their cart. A full SEO module for boosting search engine rankings, connecting to social media and more. Overall, it would be impossible to cover every single one of PrestaShop’s features. But you can rest easy knowing that it’s filled with goodies for all stores, big and small. Along with order management, customer management, insights, and automated email alerts, the feature collection appears impressive. Although most of the time you don’t have to spend extra money with an e-commerce solution, PrestaShop is a tad different. Since PrestaShop is open-source and free, it works similar to Magento and WordPress. Therefore, you get the benefit of not having to pay for the software, but you’re still stuck with getting hosting, a domain name, and whatever design tools or services you need. When you sign up, however, PrestaShop offers to get you configured with hosting and a web designer if needed. Neither of these is required, but the rates are pretty good for both. And PrestaShop tries to upsell you on these during the checkout process, so we’d definitely consider them part of the PrestaShop business plan. As mentioned before, you have the option to find your own hosting if you want. However, this might make the process for you a little bit easier. Not every hosting company has a one-click installation button for PrestaShop, so you may have to go the manual route. If you do have plans to find your own hosting company, make sure you ask them if a script or one-click installation button is provided for PrestaShop. Otherwise, you’ll be doing more work than needed. The hosting offered by PrestaShop is through 1&1 Hosting, which is a quality provider, mostly known for its extremely low monthly prices. The hosting through 1&1 is entirely compatible with PrestaShop and ready to go for you to start building your site. An easy installation with a click and build tool provided through 1&1 Hosting. An optimized environment (speedy, secure and ready for search engines) for your online store. A daily store back up so that you don’t lose any website or customer data. This comes in handy if your site happens to crash or get hacked and you need to restore any of lost data. Great technical support for your hosting account, available 24/7. A minimum of 2.5 GB of RAM. Support for at least one website. At least 100 GB of storage. At least 100 email accounts. In our experience, 1&1 is a reputable hosting company with solid pricing. PrestaShop also vouches for them, otherwise, they wouldn’t have partnered with the company. Therefore, you have the choice to either go with 1&1 Hosting or to consider other alternatives. PrestaShop has an intuitive website builder, but some companies or individuals might prefer having an expert take the reins. In this case, you’ll end up spending a good chunk of change, but the partnership with PrestaShop seems to keep the prices down quite a bit. Not only that, but PrestaShop has vetted all of the experts they would consider pairing you with. So, you’re in good hands and you have the chance to customize your shop any way you want. These are all trained and experienced experts who know how to work with PrestaShop. You receive full tech services and a direct line to the person you’ll be working with. They provide custom integration and services. So, for example, you might want to integrate with a custom accounting software or with a forum system. Regardless of the request, the PrestaShop experts should be able to handle it. You receive marketing and business support, meaning they’ll give you advice and provide tips on what integrations to take advantage of. The PrestaShop expert market has filters for finding the right type of person or agency. For example, they have options for web agencies, marketing agencies, and module creators. PrestaShop offers a wonderful tool for finding experts in your country or region. For example, you may be okay with working with a remote developer, but many people would rather have someone in their own country. So, a company in Spain would choose the Spain dropdown to get someone who speaks Spanish. All of the experts are rated based on their experience and time as a PrestaShop expert. You can view a profile of the expert, visit their website for examples of their work and contact them to ask about anything you want. The main reason PrestaShop is so special is that it’s a free, open-source e-commerce solution without a clunky or complicated interface. They even have a one-click setup for hosting, so the complete beginners don’t have to set out on a hunt for the perfect hosting company. The open-source nature means that you get support from a wide range of sources. People are talking about PrestaShop constantly, so you can expand your knowledge by exploring the forums and blog posts. In addition to this, the large collection of themes and modules takes PrestaShop to the next level. Most users find at least a handful of visually appealing themes for their stores, and the modules are interesting to test out as well. PrestaShop offers support for migrating to the system if you’re already running on another platform. They also offer training through interactive courses. PrestaShop has several optional support plans that typically cost you a few hundred dollars. Many site owners are willing to pay for this dedicated support when running a business. If you are looking at PrestaShop, you have likely heard of osCommerce as well (osCommerce is another well-known, open source e-commerce platform). How do these two options compare? PrestaShop is more popular, and it is a good option for users who are looking to launch a smaller store. There are lots of add-ons available (partially due to its extensive community of developers). PrestaShop is slightly easier to use, has strong SEO, and supports multi-language use. osCommerce, however, is a better option for more technical users due to its developer-friendly design. The number of plugins that add features and functionality to your site is smaller in number than it is for PrestaShop, but there are still over 7,000 options. osCommerce is less user-friendly when it comes to building international shopping sites, but it is still a very customizable option. You’re interested in a free e-commerce solution. You like the idea of getting support from the open-source community. You’d like most of the necessary e-commerce features built into the system. You want a friendly interface but still need access to source files. You like the idea of having access to hundreds of themes and modules to expand your store and make it beautiful. You’d rather go with a more consumer-friendly solution with everything included like hosting, domain names and security. The thought of no support team scares you, or the support pricing packages are out of your budget. PrestaShop is definitely a solid choice if you need to set up an online store with plenty of customization options. But if you’re looking for an all-in-one solution that is a bit more hands-off, this one might not be the right choice. You are here: Home > E-Commerce Solutions: Which Is Best For Your E-Commerce Business In 2019? > Prestashop Review: Selling Stuff Online? Here’s What You Need to Know About This E-Commerce Platform. Previous: Ecwid Review: Why Use This E-Commerce System And Keep Your Current Website?